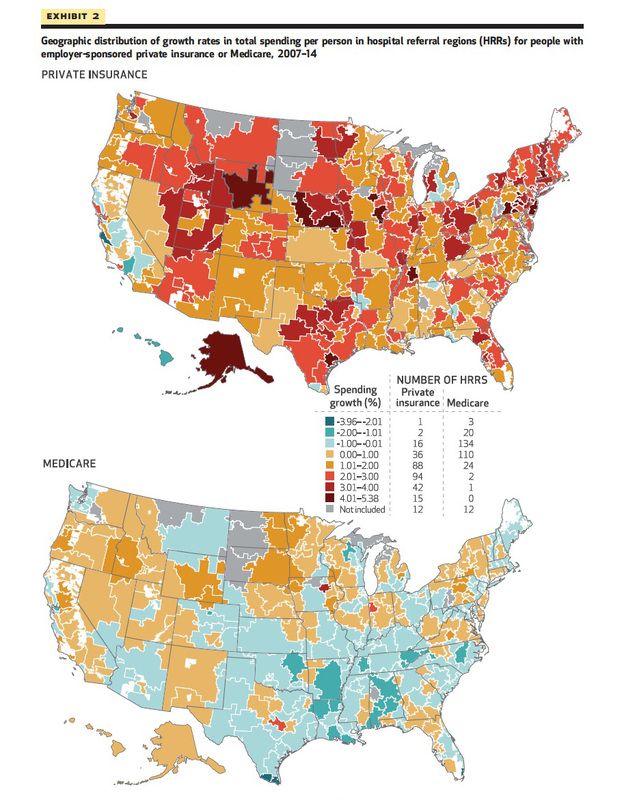 The Health Care Pricing Project uses insurance claims data from Aetna, Humana, and UnitedHealth to examine the variation and growth in health care spending on the privately insured. Abstract: We examined the growth in health spending on people with employer-sponsored private insurance in the period 2007–14. Our analysis relied on information from the Health Care Cost Institute data set, which includes insurance claims from Aetna, Humana, and UnitedHealthcare. In the study period private health spending per enrollee grew 16.9 percent, while growth in Medicare spending per fee-for-service beneficiary decreased 1.2 percent. 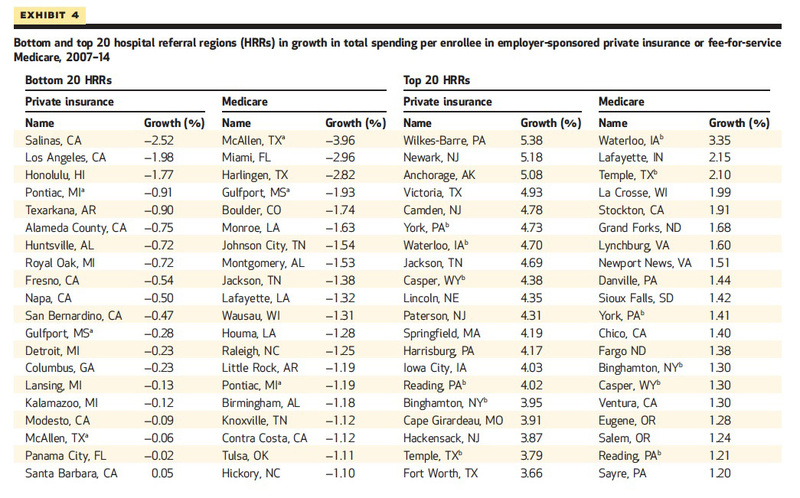 There was substantial variation in private spending growth rates across hospital referral regions (HRRs): Spending in HRRs in the tenth percentile of private spending growth grew at 0.22 percent per year, while HRRs in the ninetieth percentile experienced 3.45 percent growth per year. The correlation between the growth in HRR-level private health spending and growth in fee-for-service Medicare spending in the study period was only 0.211. The low correlation across HRRs suggests that different factors may be driving the growth in spending on the two populations. Growth in spending for people with employer-sponsored private insurance or fee-for-service Medicare between 2007–2014. Geographic distribution of growth rates in total spending per person in hospital referral regions. 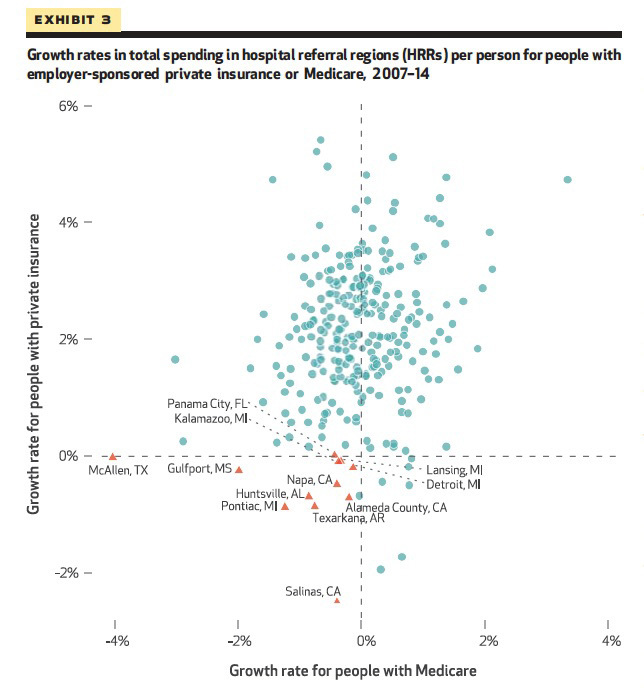 Growth rates in total spending in hospital referral regions. Copyright © 2019 Health Care Pricing Project. All rights reserved.